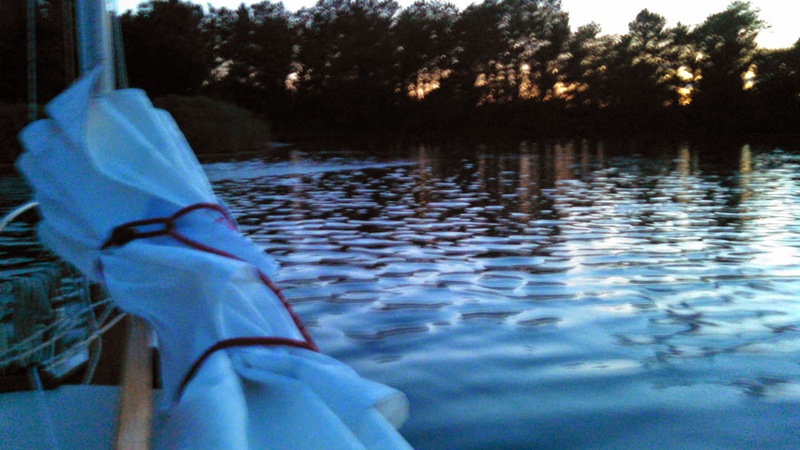 Last year we attempted the Watertribe North Carolina Challenge, but it was cancelled due to strong winds. 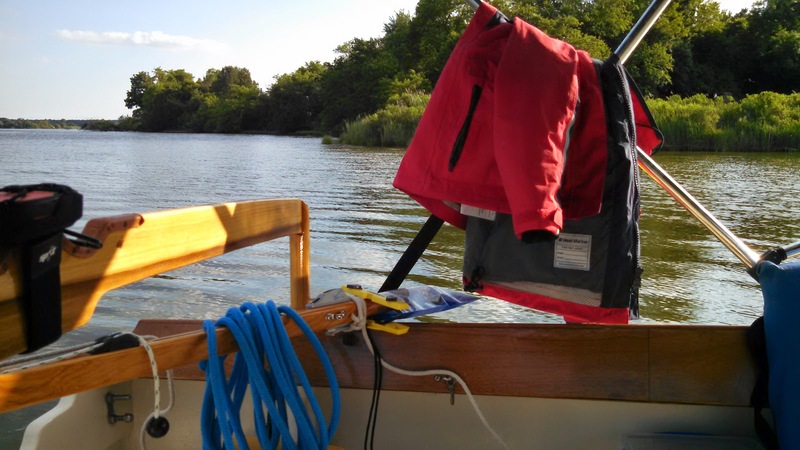 In late September, we tried again with our latest boat, a Core Sound 20 mark II newly christened Wren. This time we made it. The North Carolina Challenge is a 100 mile race through the rivers and sounds of the North Carolina Outer Banks near Beaufort, NC. 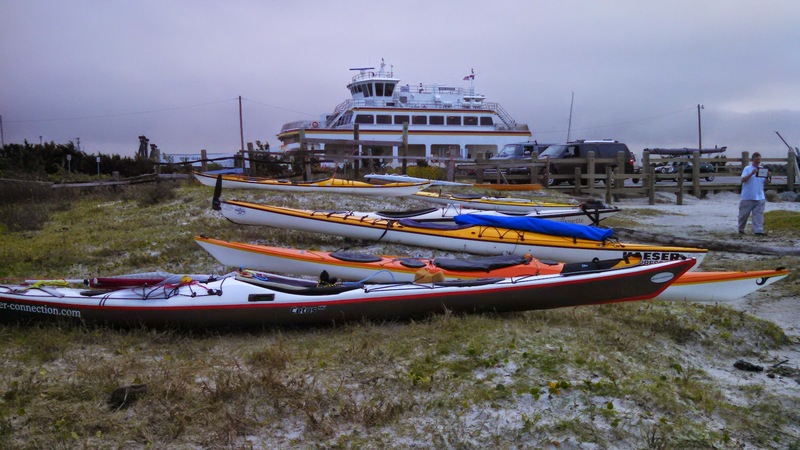 It is attended by a motley collection of kayaks and small boats from all over the US. Watertribers adopt "tribal names" (I am Sharpie and Julie is Hillkiller) and in this post I will refer to the participants by their tribal names. In response to last year's cancellation (the first and only) the race organizer, aptly nicknamed Chief, updated the rules to account for severe weather conditions. 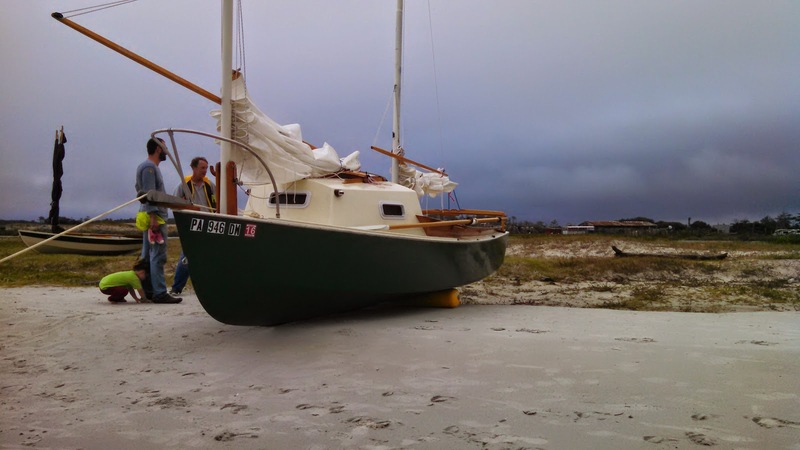 Thus, at the 7:00am captains meeting, when faced with a small craft advisory and 20+ mph winds pounding the beach, we were discouraged from starting but could use our own discretion. We were also offered an alternate starting point that was more protected than the open surf. About half of the boats decided to launch from the beach. Julie and I decided to go for it. 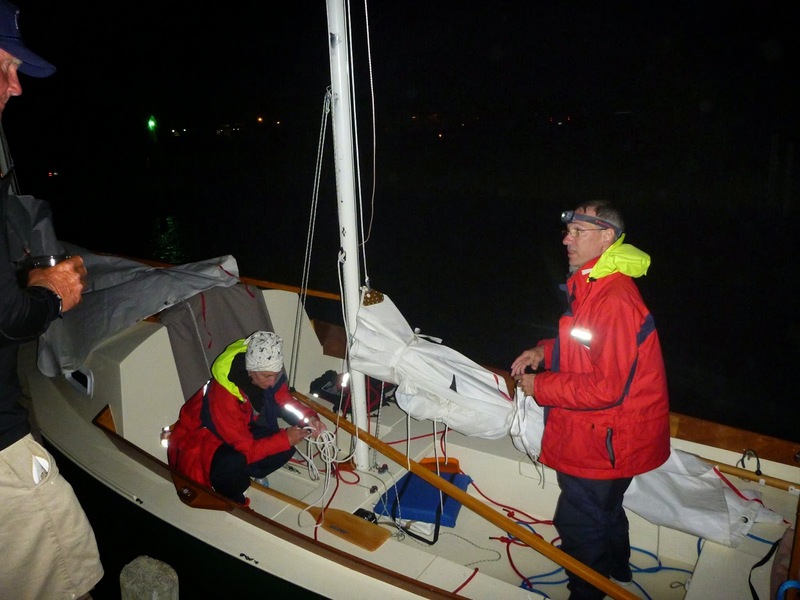 Unfortunately, I had made the mistake of watching SOS and DancesWithSandyBottom (Alan and Paul Steward) in their Core Sound 20 Dawn Patrol sail off same beach in similar conditions in 2013 - they made it look easy. By contrast, it took us three tries to get off of the beach. We almost made it on the first try, but just as we were making it into the open water the rudder bottomed out on a sand bar and popped out (I had forgotten to put in the retaining pin). Back at the beach, SOS suggested adding a bit more sail so we could power through the surf, but I was reluctant. 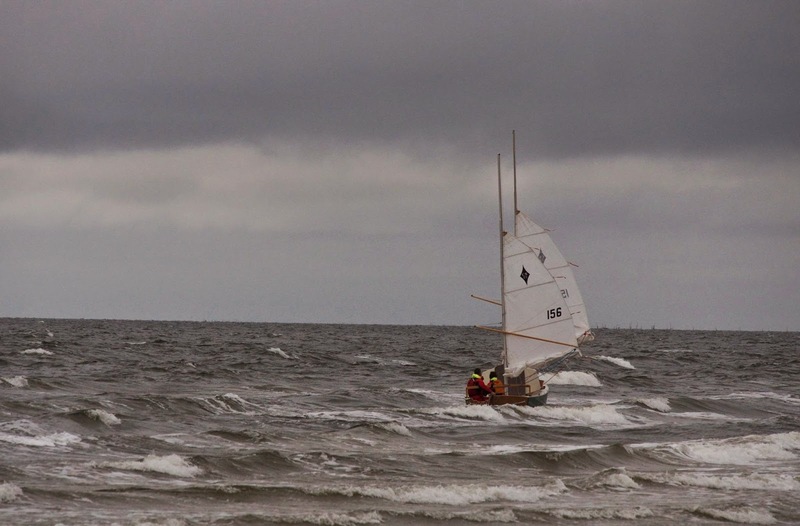 Second try, we took a less favorable eastward tack and the waves kept pushing us backward. On our third try, the wind picked up a bit and that was enough to get us out. In retrospect, I believe SOS was correct in suggesting more sail. We may also have had our sails a bit too flat. Some of the smaller monohull sailboats (Class 4 in Watertribe lingo) used oars and paddles as an assist but I think this probably would not have worked for us. Wren on the beach, ready to start. 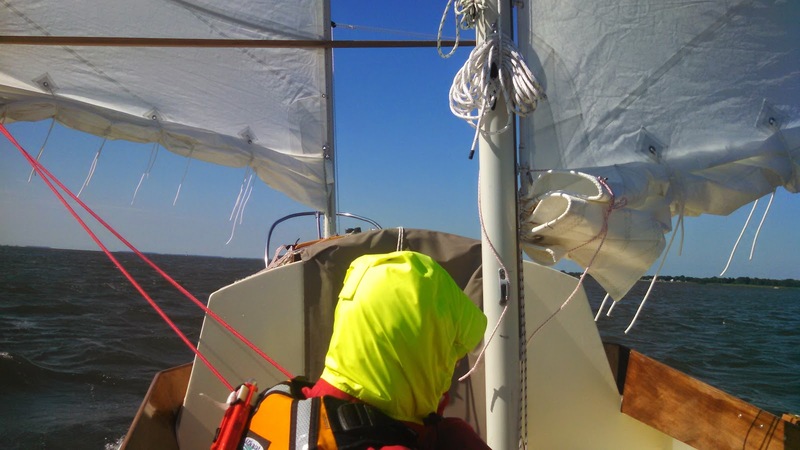 Once we got out past the breakers we sailed upwind for 10 miles into the Neuse River. We overtook SkinnyGenes and SkinnyJeans in their tricked-out Thistle which they had reefed down to a tiny triangle on the mainsail. They were getting so much water over the side that they had to bail continuously which made us appreciate our self-bailing cockpit. 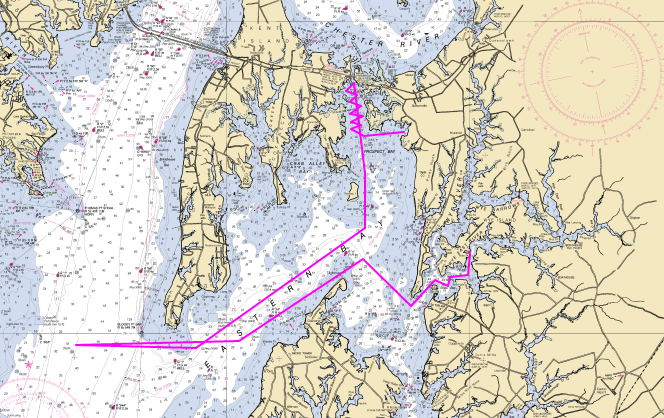 Once we hit the Neuse river, we settled down for a leisurely 25 mile downind ride to the mouth. The Jeans/Genes, now a mile or two behind, raised a spinnaker and started to overtake us. Our average speed was about 7 mph, but I knew from experience we could be averaging closer to 10 mph if we were to shake out a reef. But Julie and I were a bit tired from the exertions of getting off the beach so we decided to relax and enjoy the ride. We waved and cheered as the Thistle overtook us and sailed on. Every Watertribe event has a set of built-in filters that limits the size and shape of boats that can enter. The beach is the first filter - everyone must launch from the beach with no outside help or equipment. The Harlowe Canal is another filter. It is seven miles long, as narrow as 20 feet, overhung with a canopy of trees and spanned by three low bridges. Boats traversing the canal must be able to lower their masts and row or paddle the entire distance (sometimes against the current) The first bridge is the lowest and this year the water was so high from rain that there was only about 5' clearance. We soon found out that even with our masts down, we couldn't fit under the bridge. 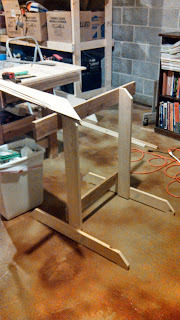 After further dissassembly, we still stuck out about 2" too high. I was able to lie on my back and push the bow down so that we slid under the bridge with only the occasional scraping sound. Once past the bridge, we were lucky to have the tide with us the whole way. The quiet and stillness were a remarkable contrast to the earlier wind, waves and spray. Julie took over rowing right after the first bridge and as DeadCat passed us in her Kayak she made a comment about women doing most of the work. I smiled gratefully. 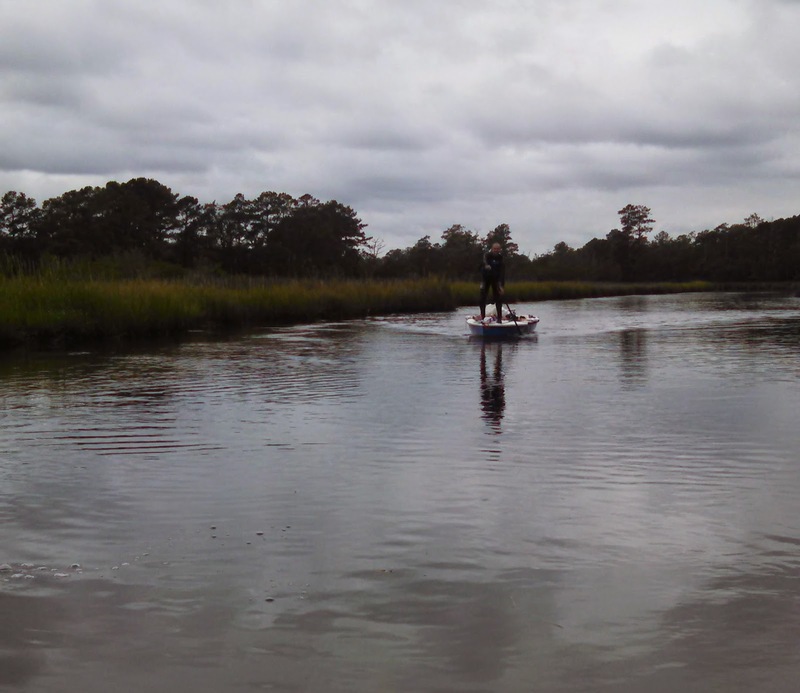 Once we got past the trees we raised our mast and glided silently through the marsh into the Newport River. We followed DodgebirdII's sail into Beaufort on a comfortable beam reach in protected waters and as the sun set we approached the Beaufort drawbridge. As we waited for the next opening, the bridge tender radioed me to ask a question, "Captain, all of these little bitty boats have come by today. Is there a regatta or something going on?" I tried to evade the question, because we Watertribers don't like to draw the attention of the authorities, but he persisted and I eventually admitted that "yes, we are together". When the bridge opened, the tender warned an oncoming boat "be careful, there is a little bitty sailboat coming through before you." 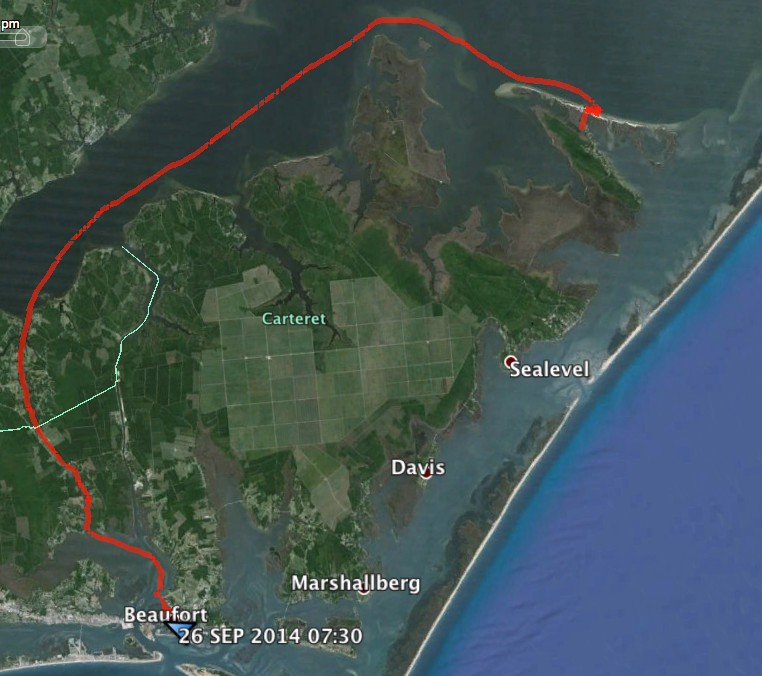 We drifted in to checkpoint one on the Beaufort waterfront at around 8:00pm just as DodgebirdII was heading out. After chatting with Chief and BeastOarman for a while we sailed over to the other side of the creek to anchor among the cruising sailboats. An hour later, with a hot meal in our bellies, we settled down in our comfy cabin, lulled to sleep by the songs of the Rolling Stones and Jimmy Buffet wafting across the water from a nearby bar. We awoke at 5:30 AM but took our time getting going. I thought I saw WildBlue's yellow Sirocco sailboat pass by, but decided it couldn't be him because there were two people onboard and he was sailing solo. I later learned that he had taken Panidias at the last moment as a crew member and there were lots of good stories arising from that collaboration. Dawn came warm with 15mph breezes from the north. 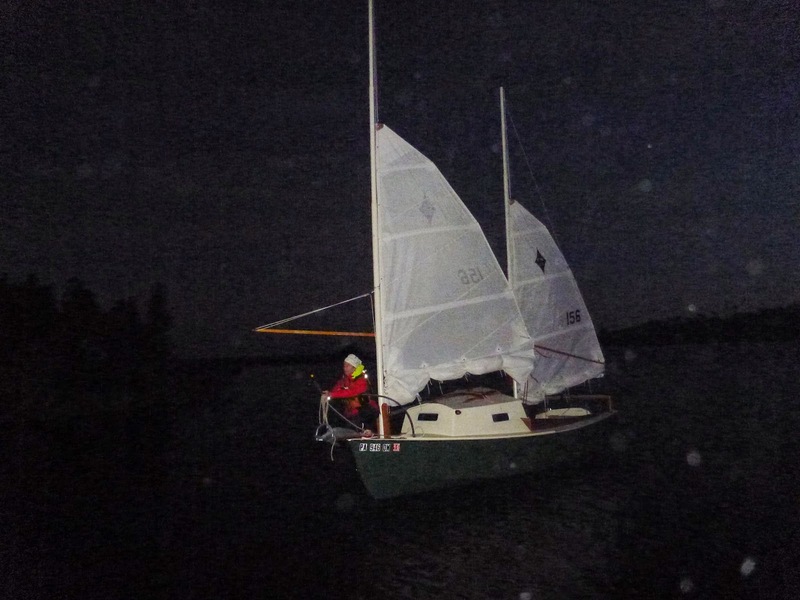 After a 10 mile beam reach we entered the core sound and began our long, 25 mile upwind beat. It was thrilling to see at least eight Watertribe sails on the move. We didn't know who all of the boats were until we swapped stories after the race, but from what I've pieced together, the field was roughly as follows: Hugging the western shoreline were WildBlue and Paindias, Sawhorse in his canoe, Ozone and ALittleDinghy in the Shellback, CleanSlate in his Triak, AmaBouy and DockWater in a Hobie Tandem Island, and a few kayakers. Taking longer tacks across the sound were ourselves, Dodgebird II in the Laser II, GrumpyCat and TweetyBird in their Hobie 16, VagueRogue and TlaloqueScramblonic in their Jet 14 racing dinghy. We looked for the Jeans/Genes but we later found out that they were out of the race because of a rudder failure. We started the day with partially reefed sails but by 3:00pm we were double reefed and pounding through short, steep chop. We had sailed the previous day without water ballast, but had decided to fill the tanks in the morning before setting out. It was good to have the additional stability and we never had to hike out on the rail, even when the boat was heeled hard over. 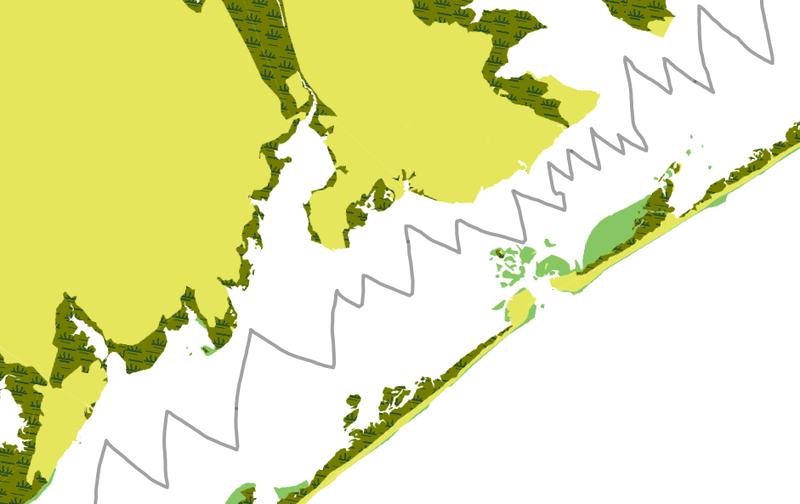 As the day wore on and the wind picked up, our upwind performance grew worse. I later spoke about our tacking performance with Roo (aka Graham Byrnes, the designer of the Core Sound 20), and SOS. 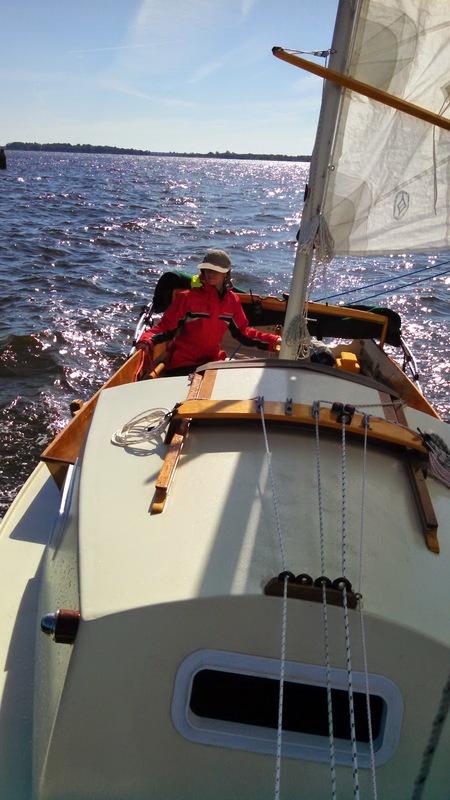 I learned that I still have much to learn about sailing this wonderful boat. For example, one problem was too much weather helm. Roo told me that I can raise the centerboard a bit in order to pull the center of resistance farther aft, thereby relieving the weather helm and giving us better VMG (velocity made good). Around 5:00pm Julie and I had a long discussion about what we would do if we didn't get out of the Core Sound by dark. 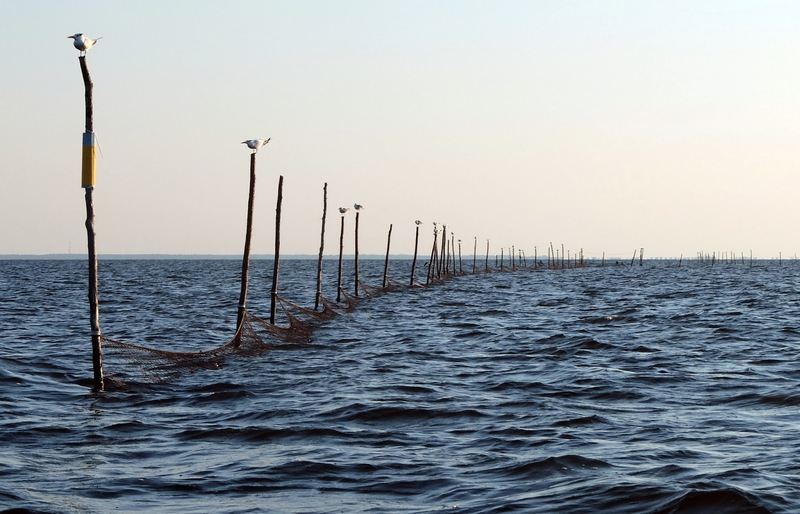 We decided that we didn't want to risk getting caught in one of the numerous pound nets at night and would have to spend another night at anchor. We really hated this idea - the next day would be exhausting because we would have to get up early, finish the challenge and then drive home all in one day. Also no hot showers that night! Luckily we just barely made it. 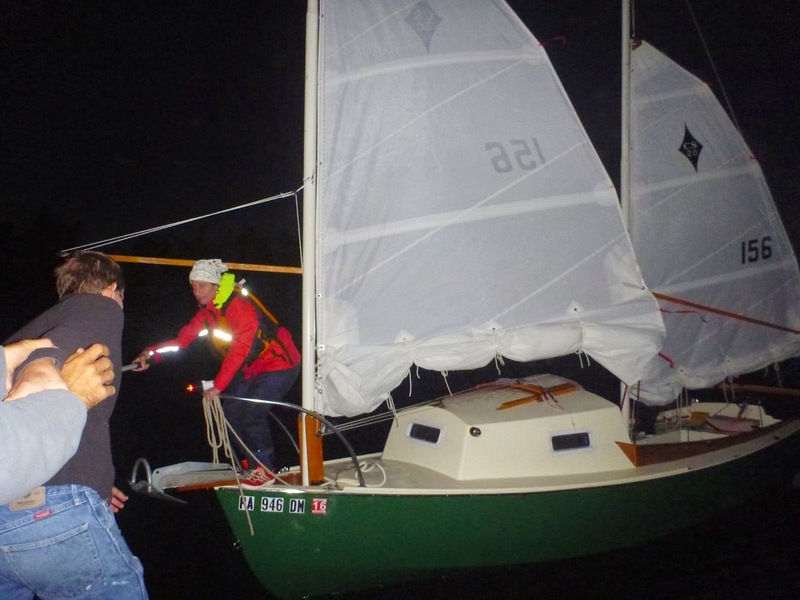 At 6:15 we clapped and cheered as we we passed the last pound net and entered Cedar Island Bay on a six mile tack to the finish. As we approached the dock with the last rays of sunlight, we passed SeaHawk in his kayak finishing up the 300 mile Blackbeard Challenge, which by all accounts had been a brutal race with lots of difficult weather. He was so set on making it those last few hundred yards to the dock that I don't think he even saw us. When we touched, we were cheered on by waiting Watertribers and I let out a whoop of joy. 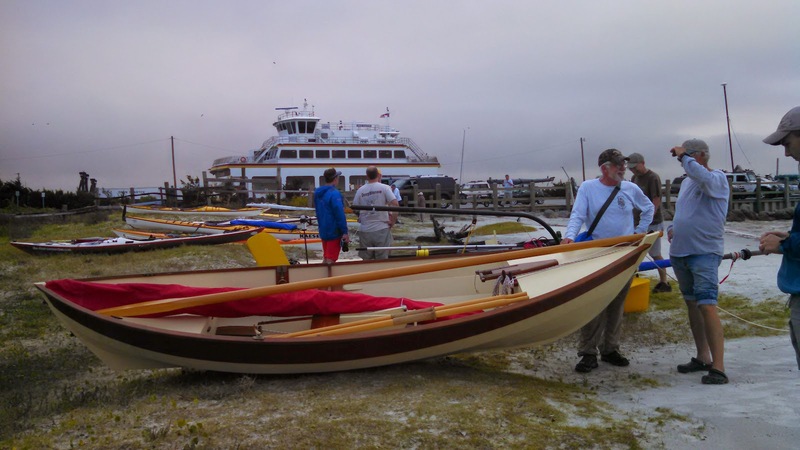 Dockside stories - I want one of those beers! We were happy to have finished without any serious mishaps. 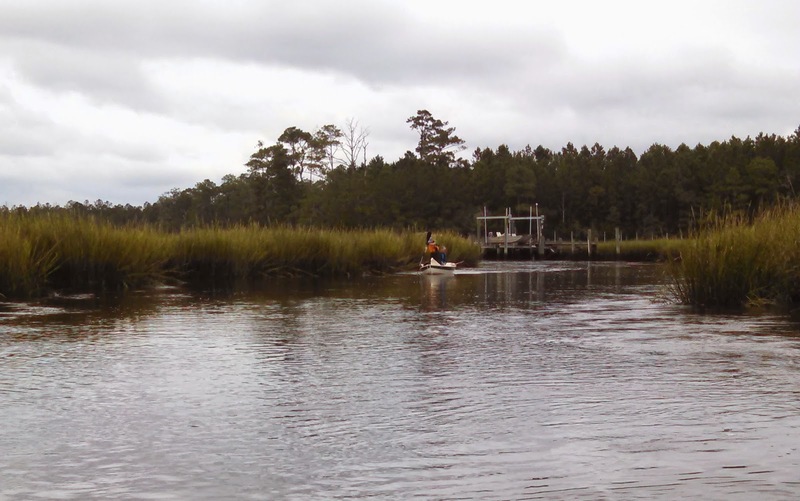 Many of the smaller boats and kayaks were not able to finish because of equipment failures, large waves in the Neuse River or strong winds in the Core Sound. The weather had favored large boats and we were the largest of the bunch. We slept very well that night. The next morning we had a great time swapping stories and then made the 11 hour drive home, glowing with pride of accomplishment and strength of new friendships. 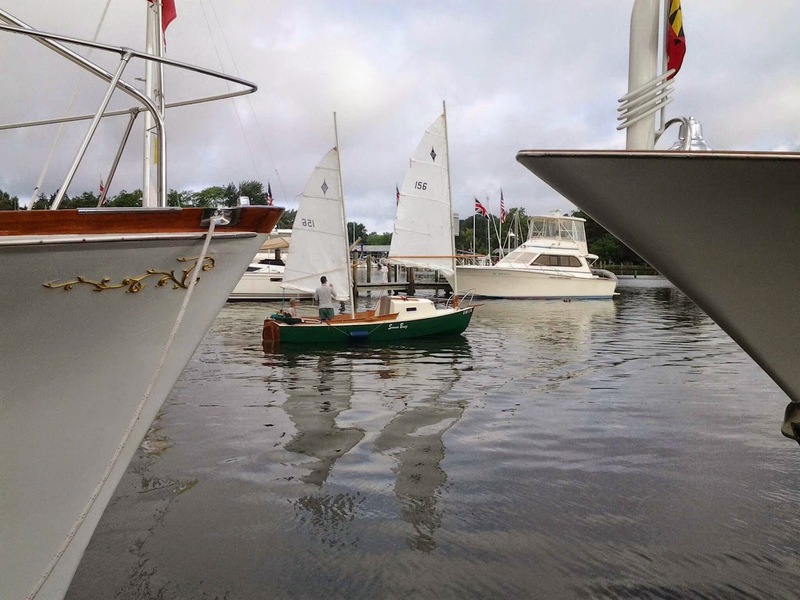 We drove to St. Michaels, Maryland in mid June for a five day cruise. 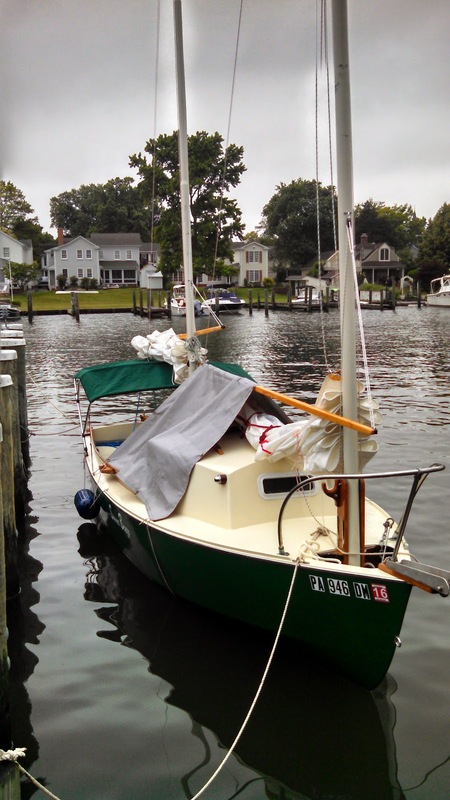 The weather forecast was for temperatures in the low 60's and lots of rain so I rented a slip at the Harbor Inn. Other than a few large power yachts, we appeared to be the only transients. It was nice to have hot showers, breakfast and other amenities. 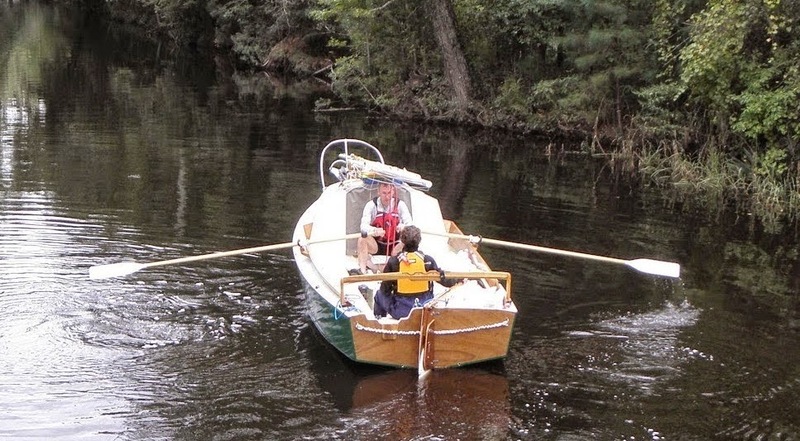 This was our first cruise in our Core Sound 20 Mark II, newly renamed Wren. 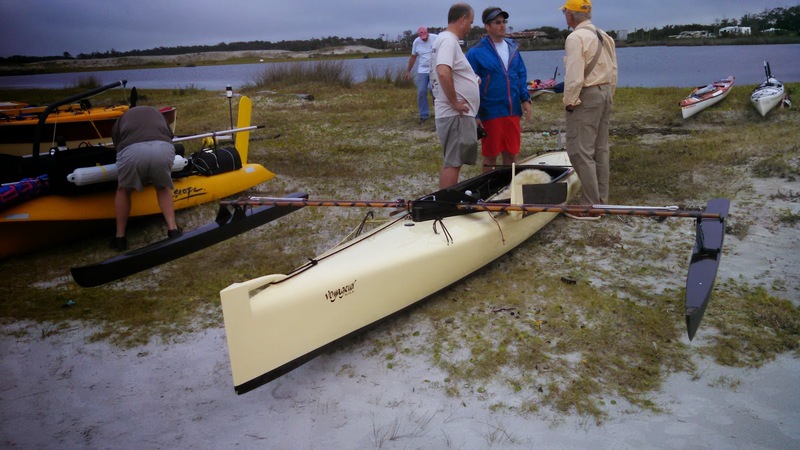 It was also training for the 2014 Watertribe North Carolina Challenge scheduled in late September so we didn't bring a motor, relying exclusively on our new oars and sail. On the first day it rained most of the time but we were able to get out for three or four hours in the afternoon. The new oars worked well and we had an exhilarating 16 mile sail to the Wye river and back under a single reef. 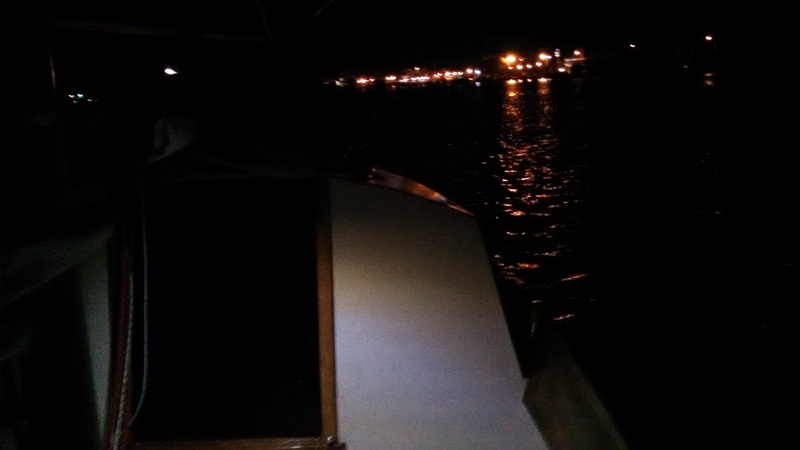 As we approached the harbor, the wind picked up so we anchored and put in a second reef. 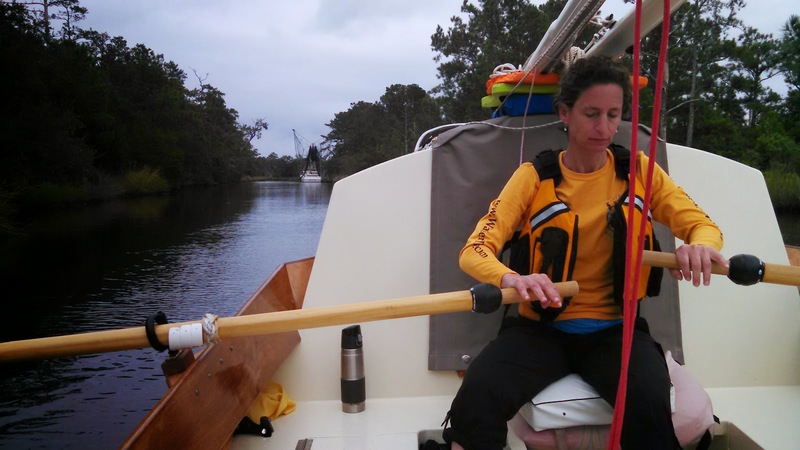 Under two reefs, we tacked into the harber and then rowed to our protected slip. A hot shower and meal at the hotel bar finished up a great day. It rained so much the next day that roads were flooded all over the town. We bought umbrellas and took the opportunity to do some walking and see a movie. The weather outlook was slightly better the next day so we abandoned our posh slip and sailed out for a night or two on the bay. Our plan was to make it through the Kent Island Narrows at slack tide and anchor north of there, but we got a late start and by the time we made it to the bridge a ominous storm front moved in from the west and we scooted into a small creek south of our target at about 3:30 in the afternoon. We were comfy in our tiny cabin by the time the storm hit and after an hour or so, the wind eased up and the rain stopped and we were able to cook a hot meal and spend a relaxing evening in the cockpit. We read to each each other from "The Code of the Woosters", by P.G. Wodehouse. The next day came bright, cold and windy with few clouds and winds at 15 to 20 mph. 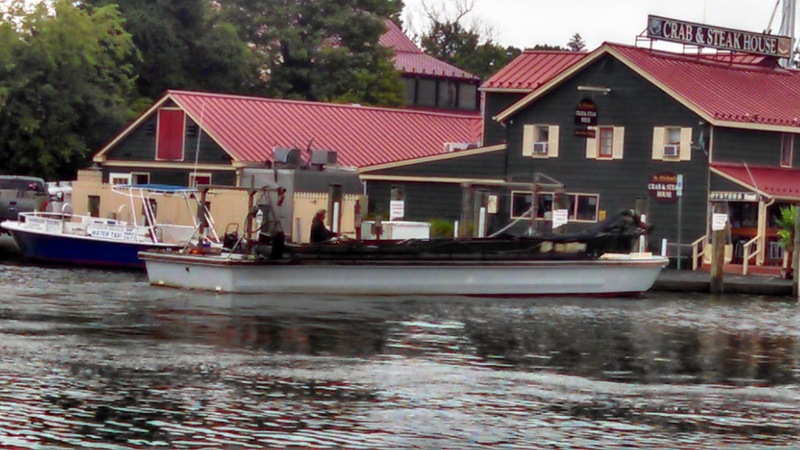 We were able to put our new boat through its paces. We started out in the morning with two reefs and water ballast. 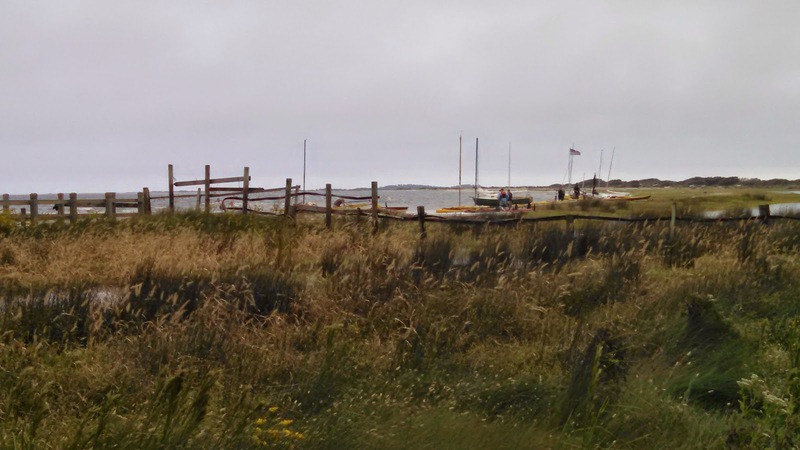 According to the nearby weather buoy winds were gusting to 27 mph (http://www.ndbc.noaa...p?station=44062). Beating close hauled to windward for about two hours, we made five miles up to Kent Narrows and then floated downwind into the bay. We always had a hand on the mainsheet but never had to pop it in a gust. It was a bit wet at times. In the open bay the wind moderated to 18-22 mph so I shook out a reef on a close reach, still with water ballast. On a boad reach with ballast we were making 7-8 mph. I put down the anderson bailer and in about 15 minutes all of the ballast water had been drained from the tank. We started surfing and gained about 1 to 2 mph. Our max speed was 11mph with one reef tied in and still a very comfortable ride. After about 41 miles of adventure we dropped anchor in a little creek off the Wye river, close to a ghostly sunken tree and an osprey nest. After dinner, we watched in amazement as the Osprey parents taught their chick how to fly. We first noticed a fuss when the chick was in the air, furiously beating its wings and making lots of noise. It was working much harder to stay aloft than the parents that were circling nearby. The chick tried to seek refuge in a nearby tree but every time it got close one of the parents would swoop down and drive it back into the air. This went on for at least five minutes until finally the parents showed some mercy and let the chick land. They didn't give it much chance to rest though - after only a few minutes they were back at it again. 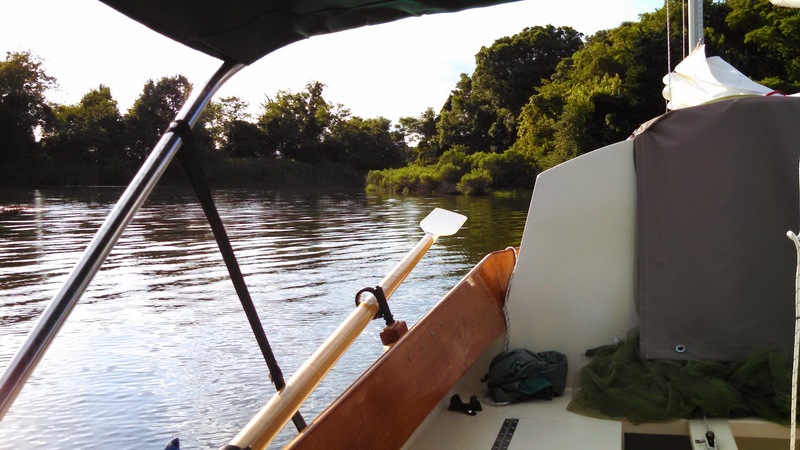 The new oars worked out very well (we didn't bring a motor). 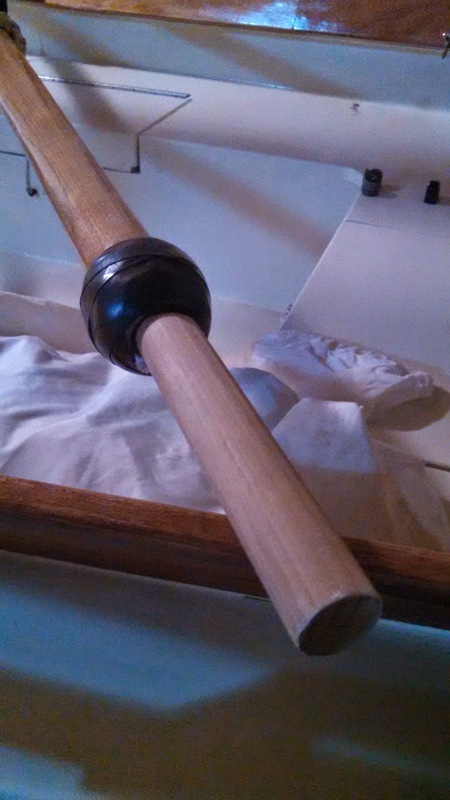 I added some weights (zing shaft annodes) near the handles to give them a counter balance. I love the way the boat heaves-to. Just sheet in the mizzen, free the main, release the tiller and she drifts gently downwind with her bow pointed 45 degrees - stable and quiet. We had a lot of rain on this cruise and it was great having a cabin but I found myself wishing for a cockpit tent. I love the anchor pulpit. My anchor can be muddy and I don't have to worry too much. I was very impressed to see her self-steering on a reach in fairly confused seas. 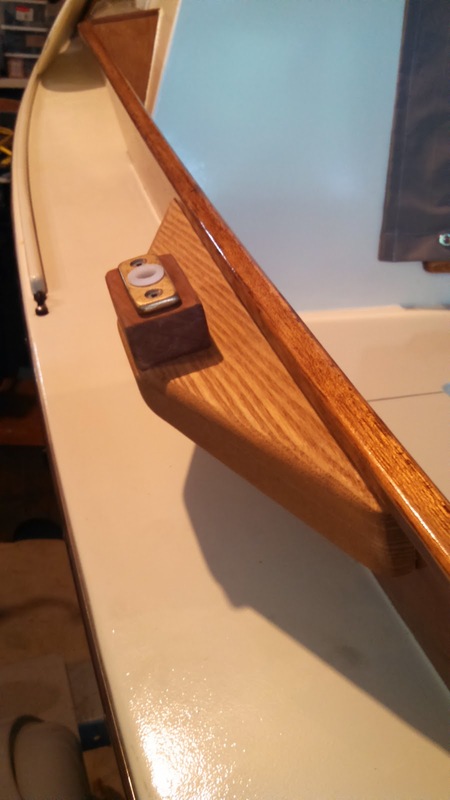 I found that I sometimes need to let the mizzen luff a bit in order to get her self-steering. Having decided on Tulip Poplar for my oars, I drove down to Hearne hardwoods and found a straight plank 12' long x 2" thick. I had them joint one edge. 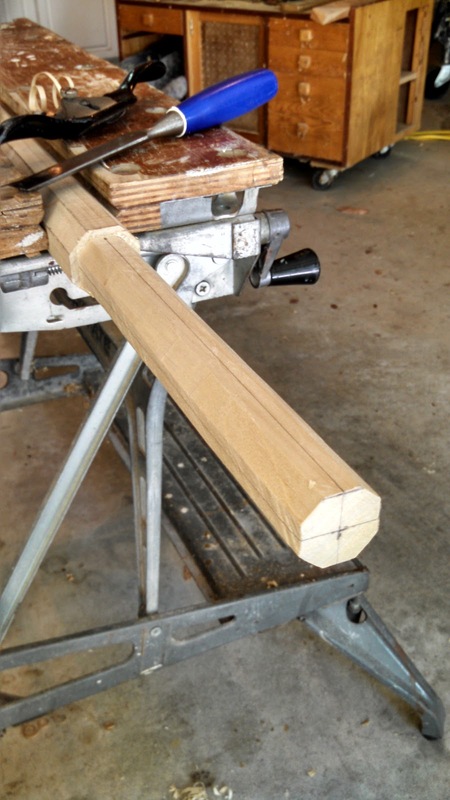 I cut the two looms to 1 3/4" square and then used my jointer to make them eight sided. I marked off 10" by 1 1/8" diameter handles and then cut them out. I used a rasp, plane, chisel and sand paper to get everything mostly round. 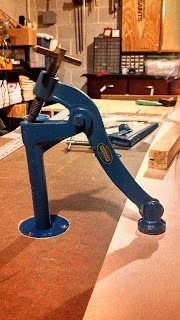 As with most of my projects, I was able to justify the purchase of a new tool. In this case it was a saw rasp from duckworks. I should have cut out the curved flats where the blades meet the looms before I rounded the looms - it would have been so much easier. Ah well. Then I glued on the blades. I didn't have any marine plywood handy so I used AC Fir. 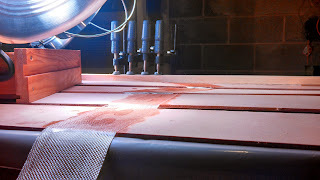 I put a fillet of thickened epoxy and embedded five or ten strands of linear fiberglass into the fillet. 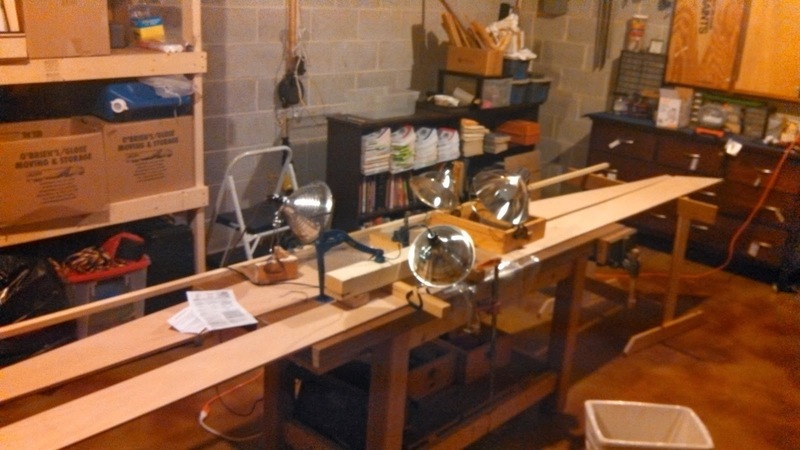 I tapered the loom with a drawknife and gave everything a coat of epoxy. 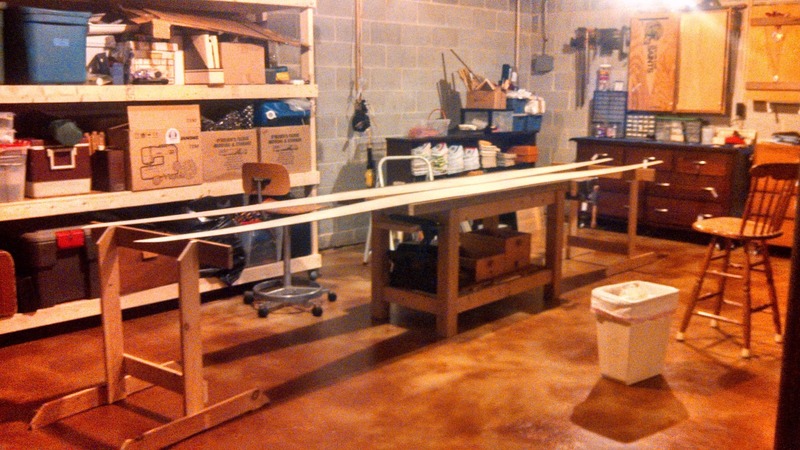 Then I put on three coats of spar varnish on the looms and a few coats of white rust-oleum enamel on the blades. I made buttons (or stops) out of 1/4" nylon braid. 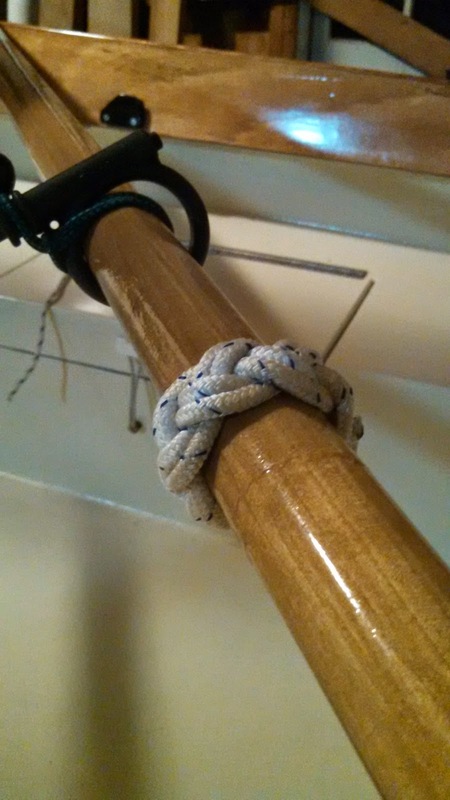 I tied a turks head as tight as I could get it but it was still loose enough to slide when subjected to a lot of force. I varnished them in place - hopefully it will be good enough to keep them in place. After a trial row I found the oars needed counter weights. 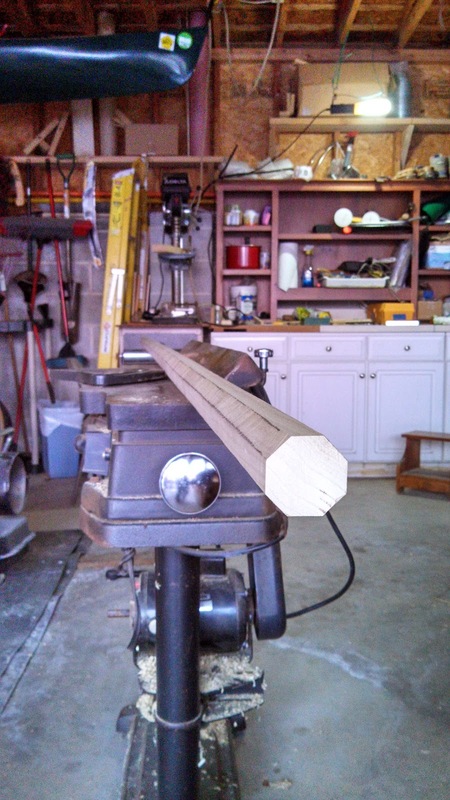 I chose 1 3/4" propeller shaft zincs, each weighing 2.5 lbs each. I think they are just right. The cockpit coaming is about four or five inches inboard of where the oarlocks are normally mounted on a Core Sound 20 so I created outriggers out of ash and cherry. The geometry isn't ideal - I have to sit on four or more inches of foam cushions to be comfortable. 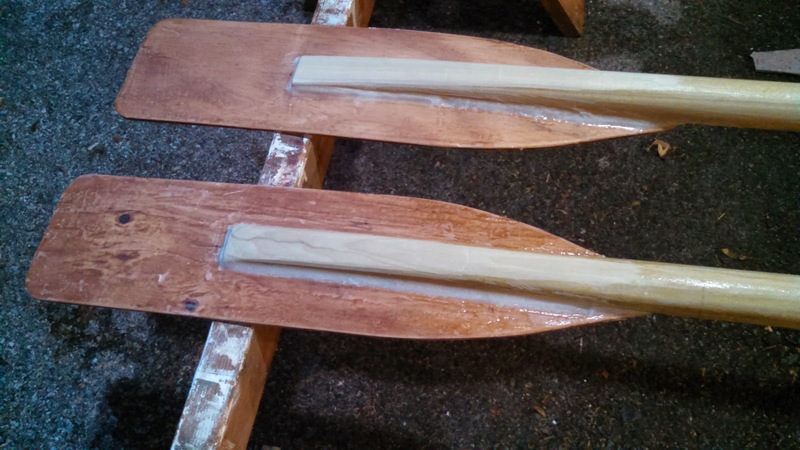 After a lifetime of small sailboats, Julie and I are building two kayaks from Chesapeake Light Craft. I'm still a sailor at heart, but Julie is probably more suited to kayaking. We can envision all sorts of fun combinations of sail + kayak. I will build the Shearwater 16 and Julie will build a Chesapeake LT 16. 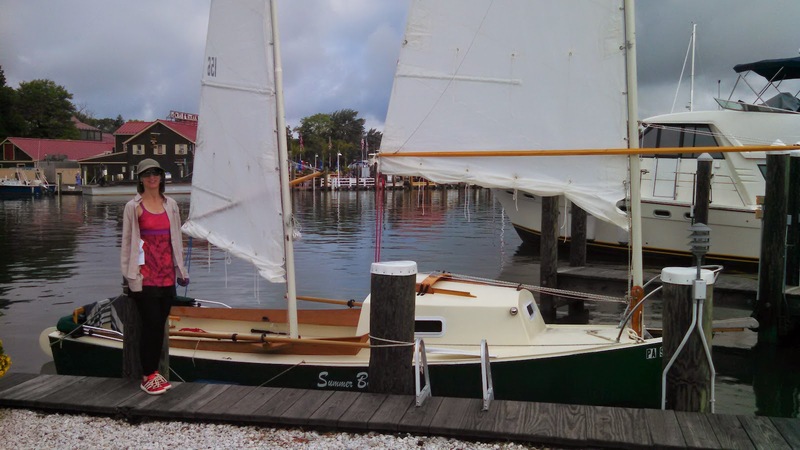 We bought the kits while at the Mid Atlantic Small Craft Festival and picked up kits a few weeks later from CLC's shop in Annapolis, MD. 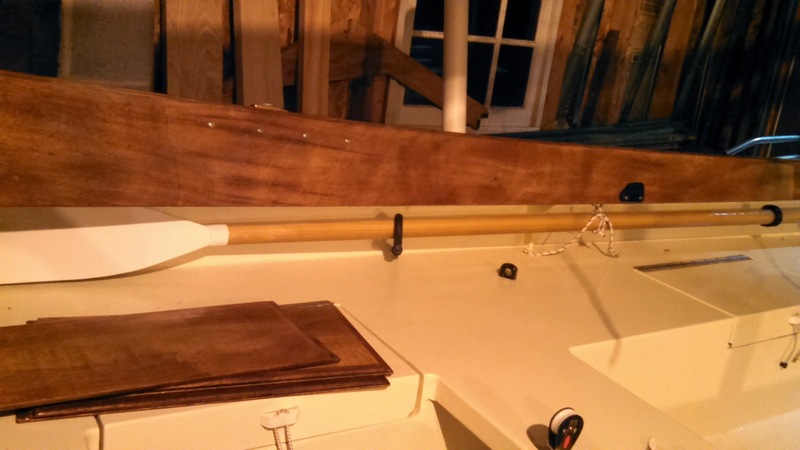 The first step was to augment my already extensive set of boatbuilding tools. This included lots of different clamps from Harbor Freight Tools. I also added to my workbench a few bench dogs manufactured by Record. I inherited these beautiful cast iron devices from my grandfather. They probably date from the fifties or sixties. 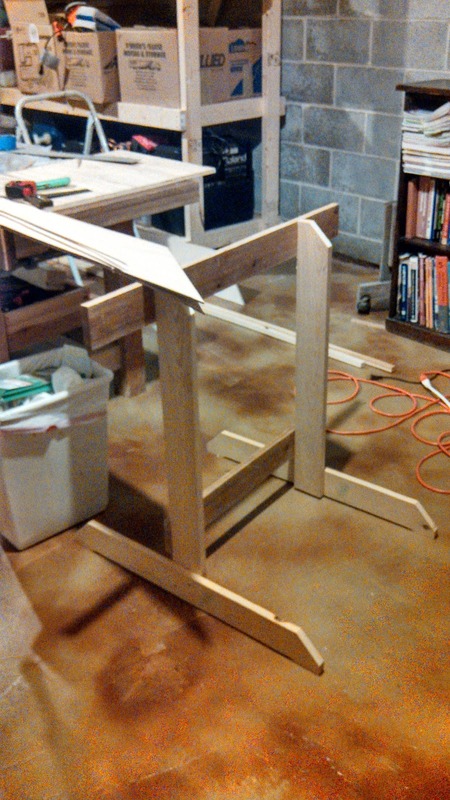 I also made a few light weight saw horses for assembling the panels. Here's a view of panels being joined together. The temperature in my basement shop is in the low 50 degrees F so we are using work lamps with 70 Watt incandesent bulbs to get the surface temperature high enough to cure the epoxy. The book case in the background has every issue of Small Boat Journal and most issues of Messing About in Boats. 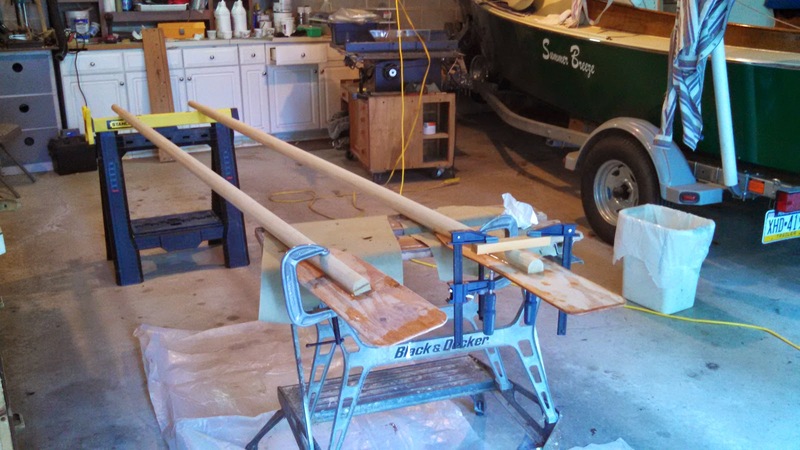 Our new Core Sound 20, Summer Breeze, needs a set of oars. 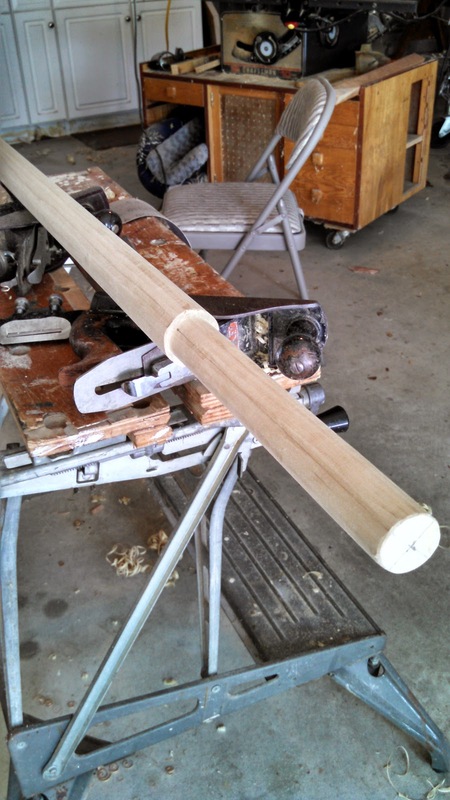 After researching various oar designs on the web and comparing the mechanical and subjective qualities of various woods, I've decided to make them out of Tulip Poplar which is cheap and plentiful here in south eastern Pennsylvania. People are surprised when I tell them of my choice so I'm posting my analysis here. Table 1 shows a few select woods that I wanted to compare. 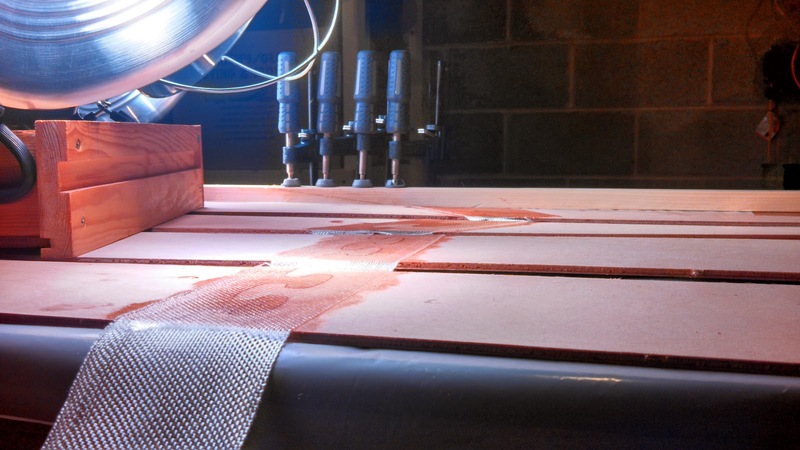 Most of the mechanical properties are taken directly from the Wood Database, a fantastic resource for investigating boat building woods. The table provides Density (how heavy the oars will be), Modulus of Rupture which denotes strength against bending force, Modulus of Elasticity which denotes bendyness, and price per board-foot. 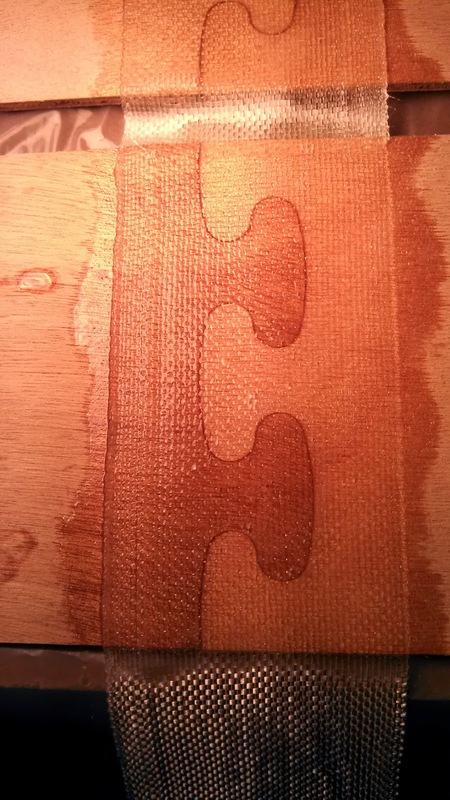 FAS is code for furniture grade wood. I want a wood that is light, strong and bendy. It should look good but not cost too much. 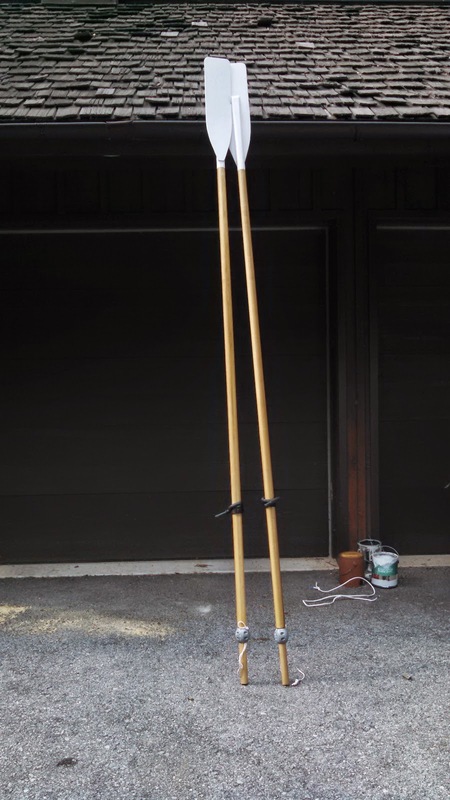 Typical woods for oars and other spars include Sitka Spruce, Ash, Pine and Fir. I am lucky to be 30 minutes drive from one of the best hardwood suppliers in the country, Hearne Hardwoods. The large yard is piled high with flitch cut logs air drying or waiting to be milled. Sitka Spruce is very expensive ($15/BF Chesapeake Light Craft). It has a good strength to weight ratio and is very elastic. Too expensive around here. Eastern White Pine is the lightest in my list but also the weakest and most brittle (least elastic). Hearne has some very clear white pine, but it is expensive. Spanish Cedar is great to work with and beautiful to look at but it is brittle, a bit heavy and on the expensive side. White Ash is the strongest (modulus of rupture) and most elastic but also the heaviest. 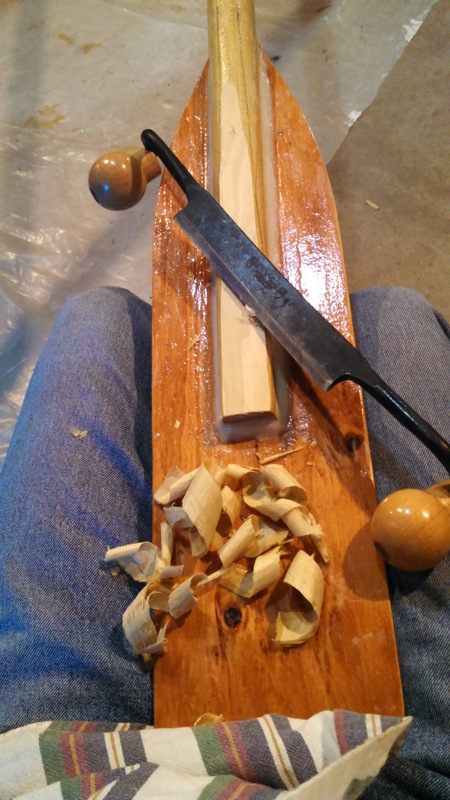 Many great paddles and oars are made from White Ash and it is inexpensive but too heavy for my taste. I included Black Cherry just out of curiosity. I think it might make fine oars. It is more rot resistant than Ash but also less strong and elastic and costs more. It is prettier, easier to work but not as tough. There is a lot of locally grown cherry in PA so it is relatively cheap here. 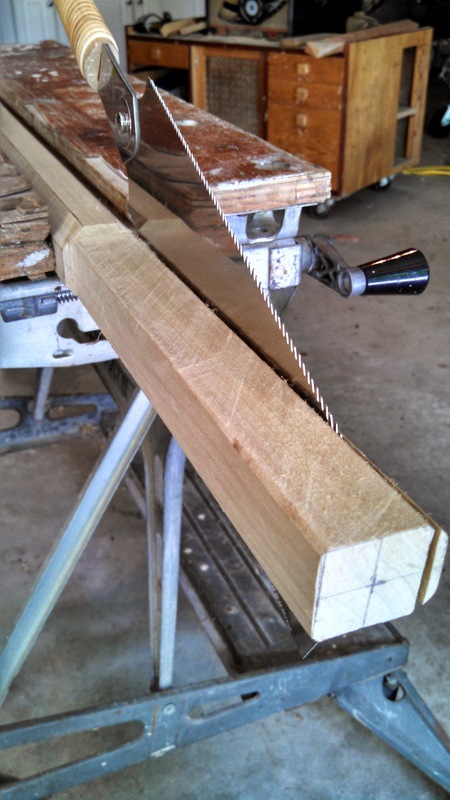 Western Hemlock (Hem-Fir) 2x stock from Lowes is cheap and has great mechanical properties. Because it is only available around here as construction lumber (common grade), even the best planks will have some small knots. 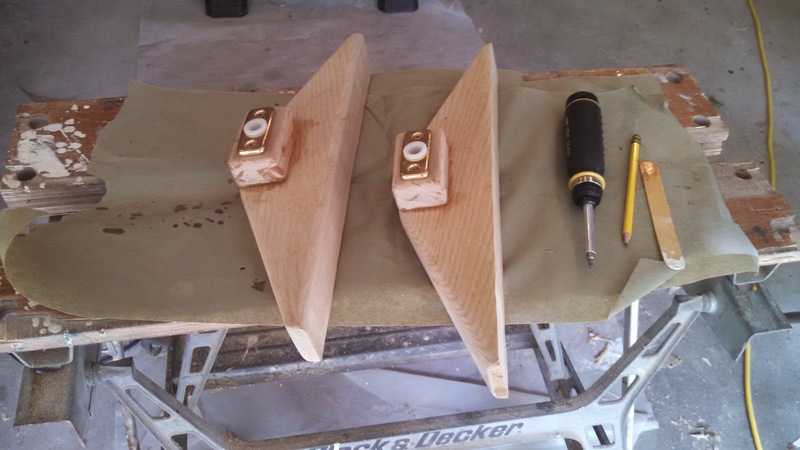 Tulip Poplar has great mechanical properties, is fun to work with and looks good. Hearne has great pricing on FAS grade (furniture grade) stock in many dimensions. Grahame Byrnes of B&B Yacht Designs told me that Hem-fir is a great alternative to sitka spruce. The wood database confirms this (Table 2). Tulip Poplar appears to be another great alternative. 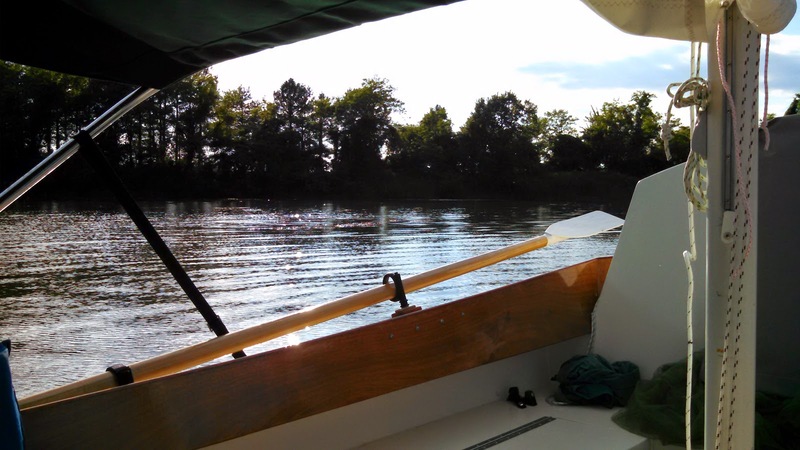 Robb White, a well known boat builder and writer used Tulip Poplar for many of his beautiful custom boats. Compared to hem-fir it is much prettier, easier to work with, just as light, about as strong and elastic and not much more expensive. Tulip Poplar is the wood for me.